NETWORK UPDATE: The only adjustments were 0.1 increases for the reruns of NCIS and NCIS: NEW ORLEANS. CABLE HIGHLIGHTS: TNT’s last NBA PLAYOFFS game of the season gave it the night at 2.48. On Discovery, THE DEADLIEST CATCH was down 0.05 to 0.97, lead-in DEADLIEST CATCH: THE BAIT was at 0.42, and SONS OF WINTER gained 0.08 to 0.44. NBC Sports Net’s NHL PLAYOFFS game was at 0.70. IF LOVING YOU IS WRONG (OWN) dropped 0.07 to 0.63. On Bravo, REAL HOUSEWIVES OF NYC grew by 0.08 to 0.55. Comedy Central’s TOSH.0 fell 0.05 to 0.53, and INSIDE AMY SCHUMER rose 0.04 to 0.39. YOUR FAMILY OR MINE (TBS) gained a tenth to 0.50. TLC’s THE LITTLE COUPLE rounded out the night’s Top 10 at 0.49, with a lead-in special at 0.27, and lead-out THE WILLIS FAMILY down a tenth to 0.22. The second night of TEXAS RISING (History) fell 0.17 from its premiere to 0.48. E!’s BOTCHED rose 0.07 to 0.39. 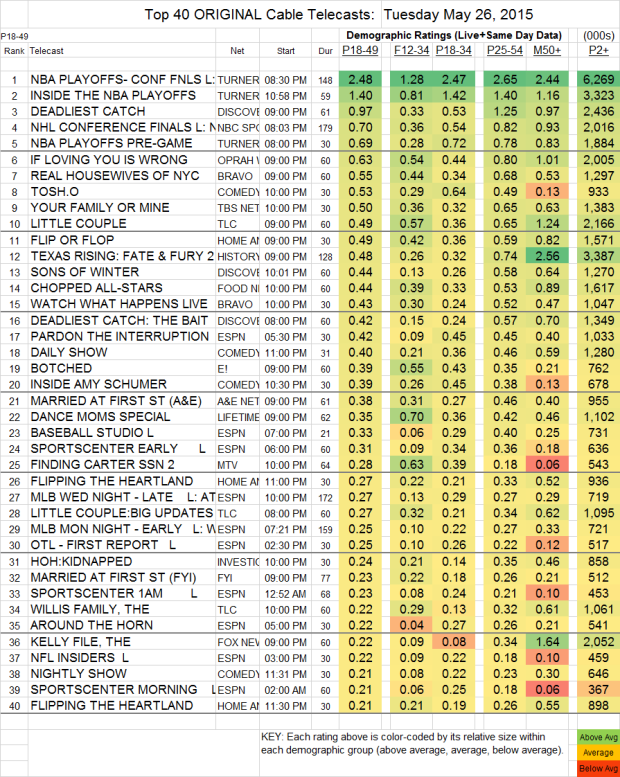 MARRIED AT FIRST SIGHT (A&E) was also up 0.07, to 0.38. A Lifetime DANCE MOMS special was at 0.35. FINDING CARTER (MTV) slipped 0.02 to 0.28 in 18-49s, and fell by 0.09 in the F12-34 demo to 0.63. YOUNGER was at 0.18 on Nick At Nite and 0.17 on TV Land, respectively down 0.04 and up 0.05.